I love being reintroduced to a vegetable. I must admit, I put parsnip on the back burner for a while. I just got tired of roasting them or mixing them up with potatoes that I just plain 'ole forgot about 'em—out of sight, out of mind. 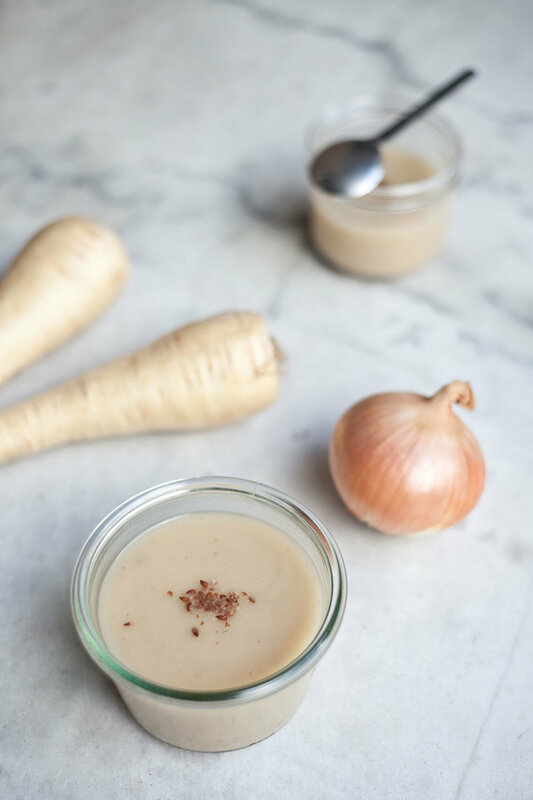 Most recently, I came across this delicious soup and I had to share because it's so simple to make and it's simply nutritious. Via Brussels, this recipe has landed on the right table. Remember Lady Jo from the ginger biscuit recipe? Well, this one is from another Jo (-hanna) and it's all in the family. Wash and peel your parnsips. Heat oil in a large pot over medium heat and cook the onions for a couple of minutes before tossing in the parsnips. The onions should be translucent and the parsnips should turn golden brown. Add a litre of water to the parnsip and onion mix and add a vegetable stock cube. Bring it to a boil over medium heat and then lower heat to simmer until the parsnips are tender. Let it cool slightly. With a slotted spoon scoop out the parsnips and the onions, and put it in the blender adding half the vegetable broth. Purée until smooth and keep adding some vegetable broth that's left over and blend together until you get the soup consistency that you like. The more broth you add, the thinner your soup will be. I was wondering what the soup would taste like without adding a vegetable stock cube. So in my second batch of soup I omitted it. The flavor of the parsnip is robust, sweet like a carrot but with a consistency of butternut squash. It's like drinking a warm sweet nectar—too sweet for me. The vegetable stock brought out the savoriness of the soup which was the perfect balance.